The 67’s will be facing three teams from the Western Conference this weekend as they look to extend their five-game winning streak. 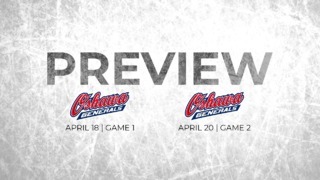 The busy weekend begins with two away games against the Guelph Storm on Friday and Owen Sound Attack on Saturday. This will be followed by the Family Day game on Monday at TD Place against the Kitchener Rangers. The Barber Poles are hot right now, with points in six of nine games to go along with five-straight victories. 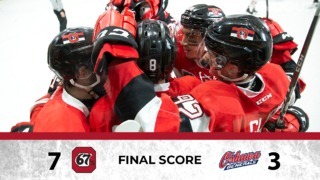 The 67’s have exhibited a never-say-die attitude in recent games after falling behind on the scoreboard; in the last five wins, three have been fighting comebacks. The hot run of play has pushed the 67’s to fifth in the Eastern Conference standings and have put themselves in a strong position as the playoff battle intensifies. On the 67’s radar will be the Niagara IceDogs who are four points ahead of them in fourth place. It’s been an overtime overdose for the Storm in the last four games. Three out of those four games extended into overtime with the Storm winning two of those battles. They have three wins from their last four games and a point from their latest encounter. This will be the second meeting between these two sides this season. The first game resulted in a 5-4 overtime win for the Storm. Over the last five games between these two sides, the 67’s have won three them. Owen Sound has lost just two of their last 12 games. 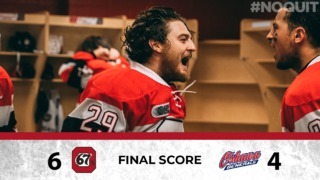 One of them was against the 67’s last week when Ottawa produced a four-goal burst in the third period to register a great comeback win. The two teams have alternated wins in the previous five games and the 67’s will be looking to buck that trend and win consecutive games against the Storm. Nick Suzuki, Owen Sound’s top scorer this season, is on a good run, having scored four goals in the last three games. The Rangers are one of the four teams to have already clinched their playoff spot. They are currently second in the Western Conference and have lost just once in their previous 10 games. One of the Rangers players the 67’s need to watch out for is winger Kole Sherwood who has 16 points in his last 10 games. The Ottawa side has lost six consecutive games against the Rangers including a 5-3 defeat earlier this year. They will be hoping for a reversal this time around. Tye Felhaber’s hat-trick against Kingston Frontenacs was his second this season. He has now scored points in six consecutive games. Kody Clark needs two more to hit 100 OHL games for the 67’s. Austen Keating has six points in his last five games. The game against the Kinston Frontenacs was the first time in five games that Sasha Chmelevski didn’t score or provide an assist.